The Wrong Sword: I can see your house from here! If you're a semiotics nerd, you're familiar with the notion that there are at least three versions of any text: the one the author thinks he's written, the actual aggregation of words, and the story the reader perceives in his head. consensus would unconsciously shape the perceptions of all the readers of that James Bond short story; all of their images of the auction would be more or less similar. But when Arthur C. Clarke describes the surface of Venus in Before Eden, or Larry Niven lays out the geography of the Ringworld, they are describing environments (and in some cases, animals and sapients) that no one has ever seen; that simply don't exist. The gaps, the things not described, the things that can't be assumed, are much, much bigger than they are in any other kind of fiction. With that much room, the mind of the reader works overtime - but so does the mind of the writer. If a writer writes what he knows, then he will draw on what he knows to fill in the blanks of his imagined worlds. In the process, he will reveal a lot more of himself than he might realize. The classic example is Isaac Asimov. His novel The Caves of Steel is a detective story set in a future in which overpopulation has driven humanity into enormously crowded underground cities. Living space is more precious than gold, eating takes place in communal cafeterias, and virtually no one uses, let alone owns, a personal vehicle; mass transit is a necessity for everyone. 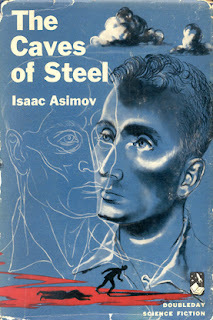 The Caves of Steel was a success when it was published. Asimov was gratified but also surprised, because there was one aspect of the reception he had never expected: Readers and reviewers assumed that his future was a dystopia, a warning of things to come. But to Asimov, it was a future that actually seemed somewhat cosy - because to describe that world, to create the believable atmosphere of the City's people movers and public spaces and crowds, Asimov had drawn on his own experience as a New York boy who loved his hometown, and as a claustrophile, someone who feels comfortable in tight spaces. Later on, in his Foundation series, the galactic capital of Trantor is a world entirely covered by a single city, with only one open park space - the Imperial compound. There's an introductory scene in which a minor character ascends an observation tower to take in a view of the city, overwhelmingly reminiscent of the trip to the top of New York's Empire State Building, and the view out onto the cityscape of Manhattan...with the green rectangle of Central Park squarely in the middle. Experience transformed is one of the great tricks in the SF writer's Magician's Handbook. It's a shortcut for those moments when you haven't the ability (or, frankly, the interest) to work out an event or experience rigorously from first principles. That's why the Enterprise in the original Star Trek functioned roughly as a naval vessel, and why the mechanics of a light saber is closer to a katana than a plasma torch. It's also why so much of Robert Heinlein's early work is so impressive. As an engineer, Heinlein was often not using personal experience. Instead, he was working out the mechanics of his settings from first principles. The way gravity functioned on the starship in Orphans of the Sky; the breeder reactor and its effects in Blowups Happen (written five years before the explosion of the first atomic bomb); the terrible acrophobia of Ordeal in Space. Larry Niven did something of the same with his aliens - the caste-ridden Moties, the ethical-coward Puppeteers, the Pak - and the extreme extraterrestrial environments of places like the Ringworld, Plateau, and Jinx. But when a writer uses personal experience, he inevitably gives something of himself away. Although Heinlein worked from first principles with the scientific aspects of his stories, when it came to the social, you could see the Missouri and the California desert peeping through, with Freemasons, Chambers of Commerce, pumpkin doin's, and high-desert bars. Some of Niven's short stories - like Cloak of Anarchy - feel like the future from LA, 1970. It's a tool that works - it helps ground the story and the reader in that consensus reality. And sometimes, it's a little "tell" about the writer.